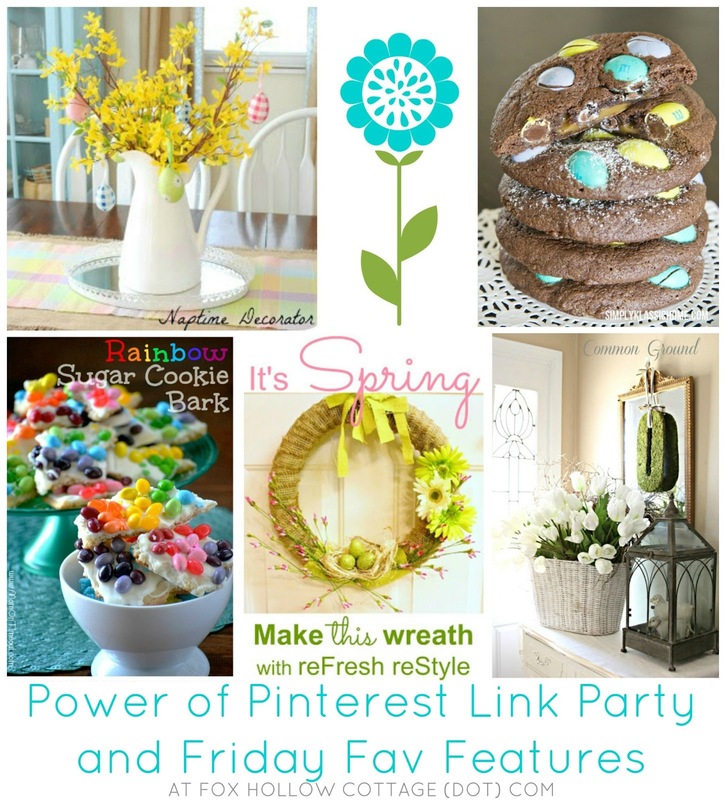 To the Power of Pinterest Weekly Link Party & Blog HopWhere I pair up with the fab Miss Doo at Debbiedoo’s. 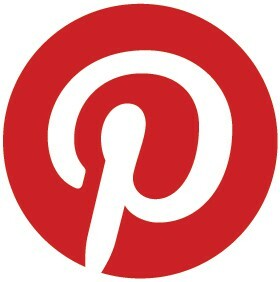 So, when you link up at either of our blogs, you show up at both! It’s double the fun.Before we start the party, I need to give some special attention to some of my very fav party goers who attended last weeks get together! I’ve been busy behind the scenes here at Fox Hollow. Last weekend, I was painting just about anything that sat still Magnolia. I’m sure I got the itch from Debra. Yeah, I’ll blame it all on her! 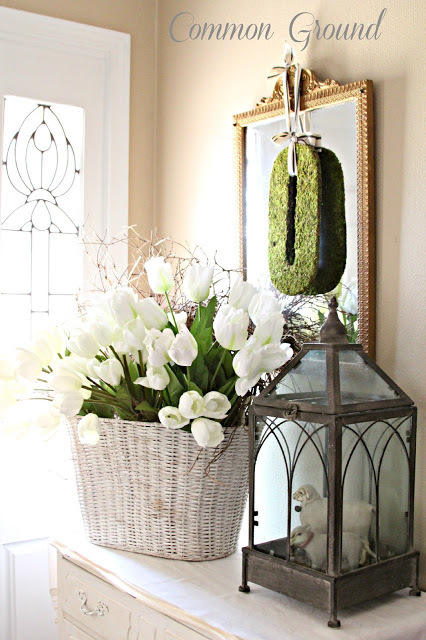 This dreamy foyer from Common Ground with it’s fresh, calm, Spring look is full of white goodness and just the perfect amounts of texture and interest! This entryway really say’s “Welcome to our home”. You know myself, along with half the free world, is dangerously in love with burlap right? Well, I sort of have a bunny thing too. Add a reclaimed window and it’s an upcycled project to get up and cheer for! From Julie at ReStyle ReLove. Upcyclyed Window – Framed Easter Bunny Burlap Art. 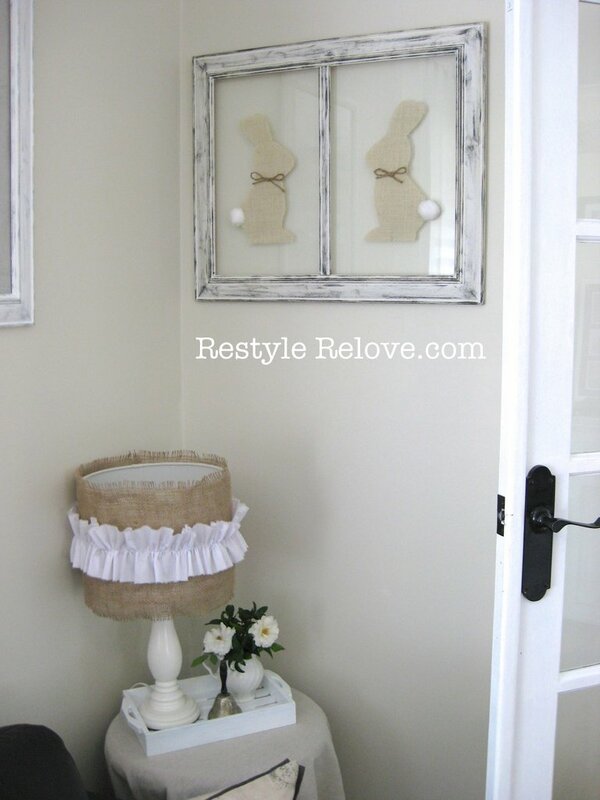 Have to give a shout out to this burlap basket project. 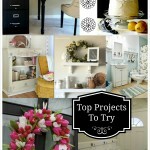 This a total DIY from the ground up project. Purple Hues made this. From scratch. 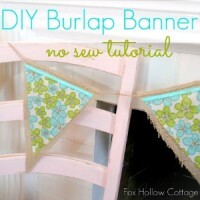 DIY a No Sew Burlap Basket from Scratch! Sometimes… it’s all in the details. …and then, there are times where you need to fake it! 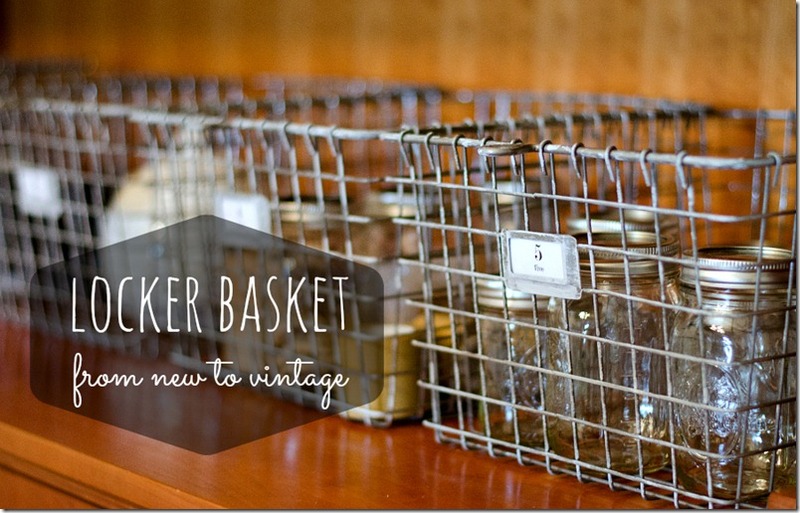 Make New Locker Baskets Look Vintage with It All Started With Paint. Love this Spring wreath from reFresh reStyle! making your own with a super clear tutorial! 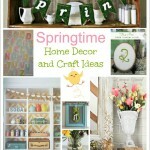 Make A Spring Wreath – Easy To Follow Tutorial! a lot of bang for the buck. This one fits the bill! 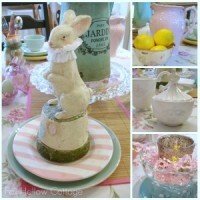 Simple, Inexpensive Spring/Easter Floral Table Centerpiece. Okay, I need some of this. Doesn’t this look like SUNSHINE. And happiness and bunnies and kittens and everything wonderful in the entire world? Mom On Timeout… send it all over. 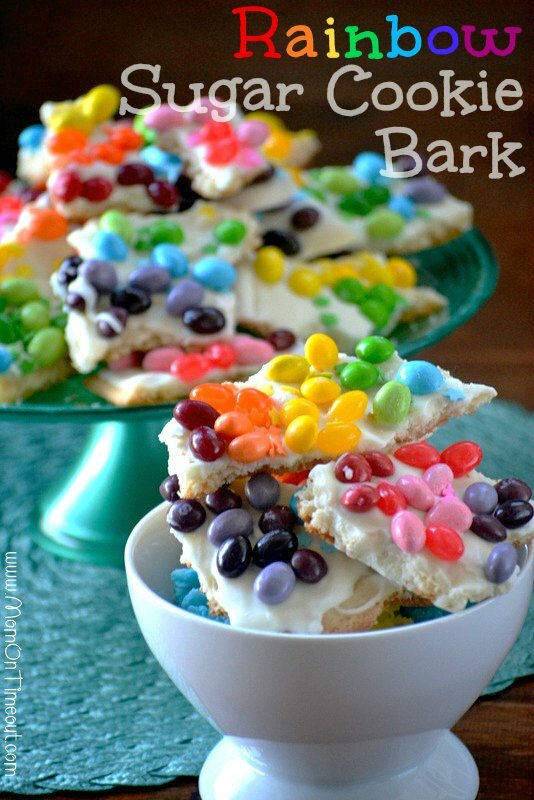 Rainbow Sugar Cookie Bark Recipe. Can you tell I have a sweet tooth? Too much temptation I tell ya. 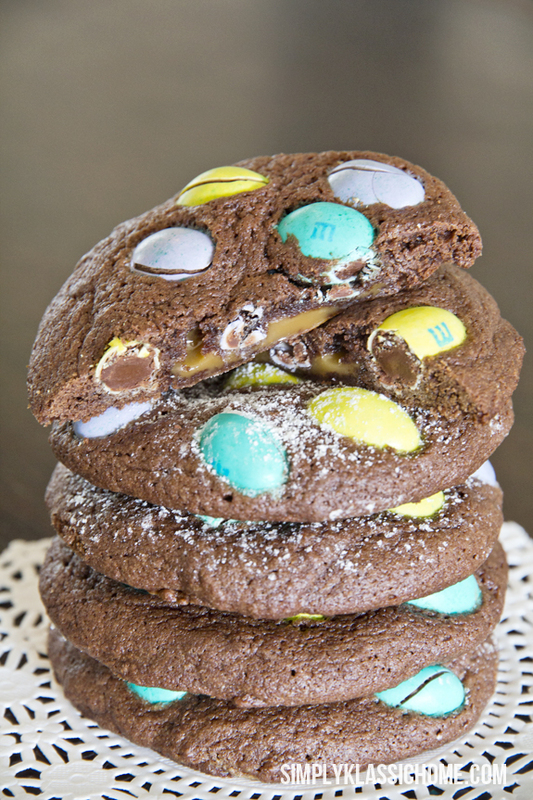 Caramel Chocolate Stuffed Cookie with Coconut M&M’s. 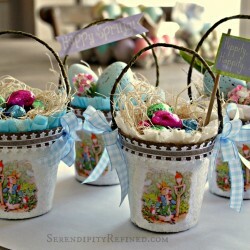 Easter / Spring Dessert Recipe from Simply Klassic Home. 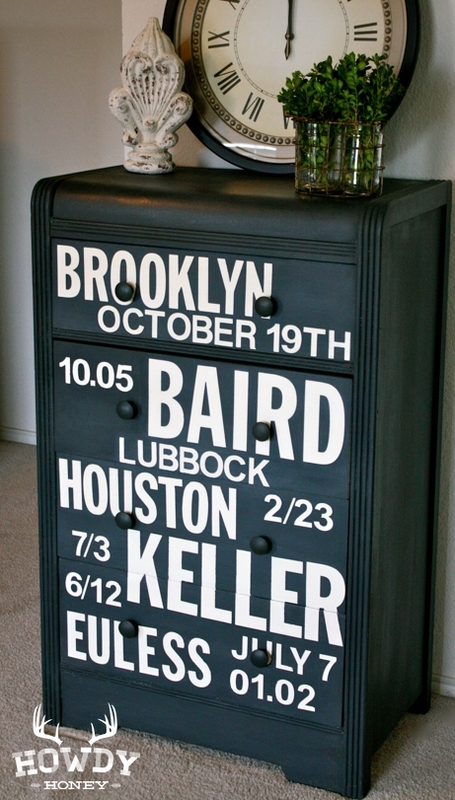 and just the sort of DIY thing I love!!! Yes. The girl has a beadboard refrigerator. Living A Cottage Life – Beadboard Refrigerator Makeover. 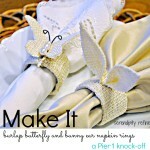 Here is a another SUPER diy delight! Full DIY Bi-Fold Door to French Door Tutorial! This before and after show stopper tells a story. “after” one to treasure for many reasons. A sentimental subway art before and after dresser makeover. 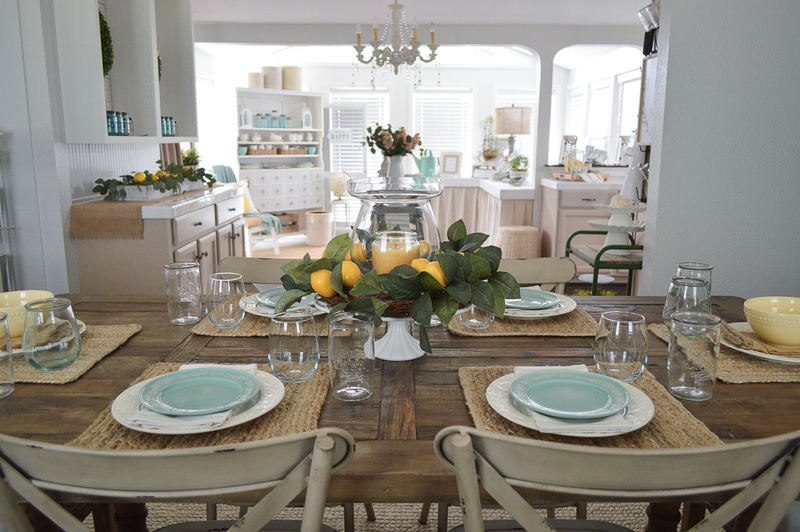 A beautiful room reveal from The Endearing Home. Please don’t miss all the pretty pictures. Go Look. 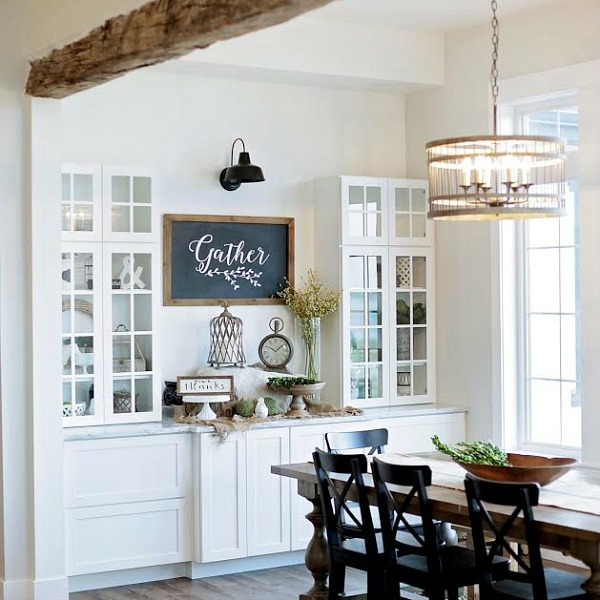 Charming Classic Cottage Mix Home – Living Room Reveal and Tour. NOW, Let’s get to POPPING!! 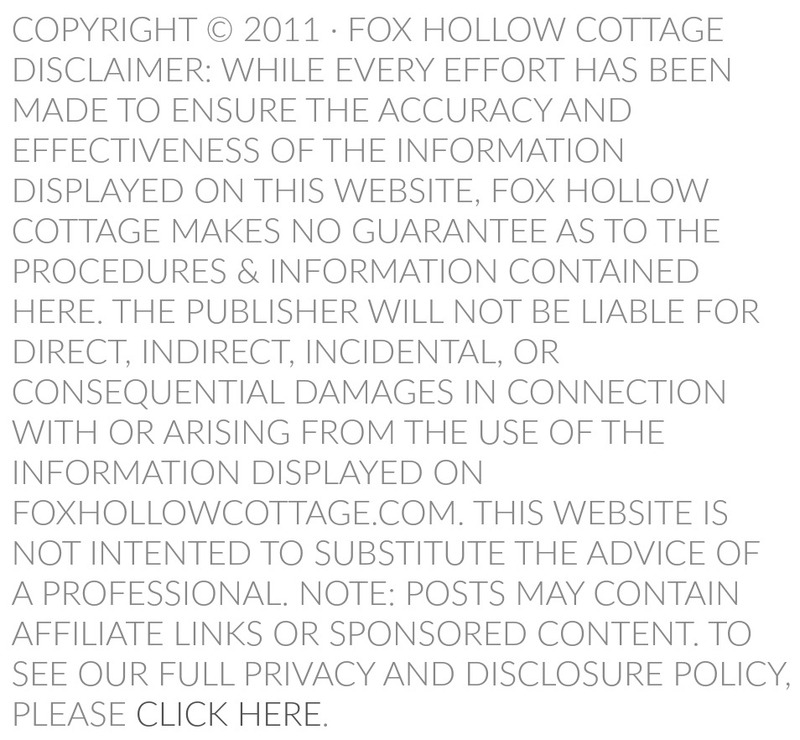 Cottage facebook page and/or tweeted about!! 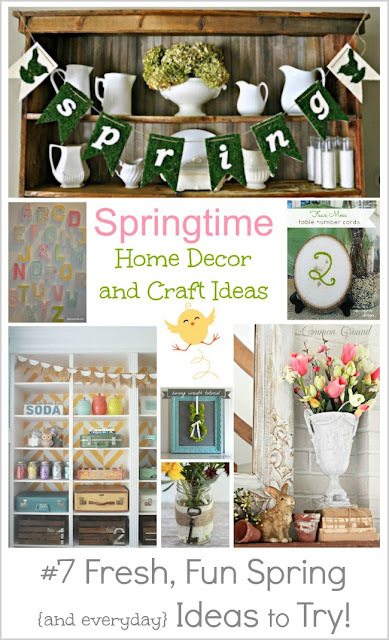 Well, you can find lots of Springy Ideas by clicking HERE. please take a moment to visit my sidebar (right side/middle) and add your email to the “subscribe” box and click submit. You’ll get a email asking you confirm this. Do it. Easy. Done. PS- The sky is falling! Just kidding… you would think so though, right? 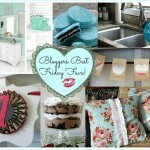 Google is doing away with it’s reader, but you can follow FHC on Bloglovin as an alternative. Or as always, sign up to get FHC by popping your email address in the “SUBSCRIBE” box as instructed above. It’s super simple. Thank you ladies for hosting the party. Linking up for the first time! 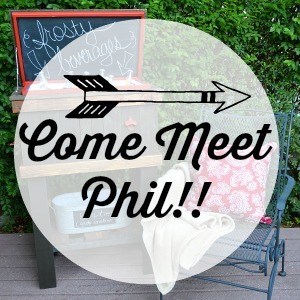 I’m over the moon over being featured on your AMAZING blog! What an honor! THANK YOU! Thanks for hosting, looking forward to your blog change. 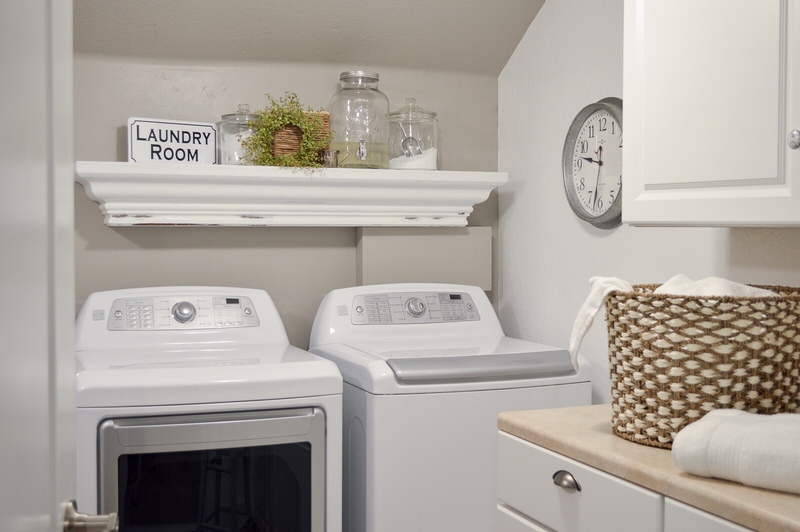 These features are wonderful!I’m a huge sucker for locker baskets, I was all over that bead board fridge, that foyer…. just stunning. The subway dresser was a knock out…..they were ALL just so amazing this week! Thanks for hosting such a great party! Have a beautiful weekend Shannon. ps. Thanks for including my wreath!! Oh my goodness, love all the features. Those cookies look so yummy and all the spring decor! Love it. 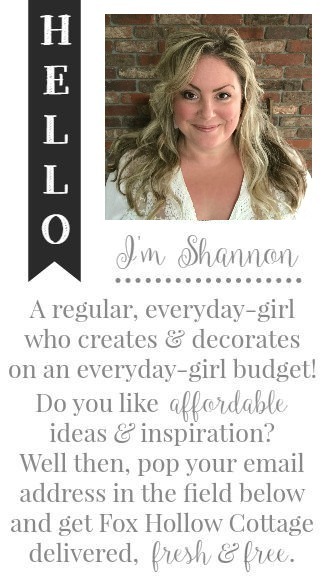 Love all those features, Shannon. Hope all goes well with your switcheroo! I love your POP parties! 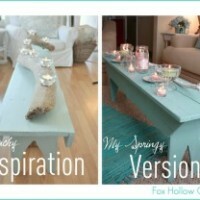 Thank you so much for including my family room in this weeks features! I am so excited and your sweet words about the room just made day : ) Have a wonderful weekend! Hi Shannon! it’s good to be back and be at your party again, I always had a blast! Thanks for hosting! Loving the features this week! Thank you! Thanks so much for having me today-I’m so excited to be back blogging again and linking up to you after a very long break!